Carte du Nouv. Rme. 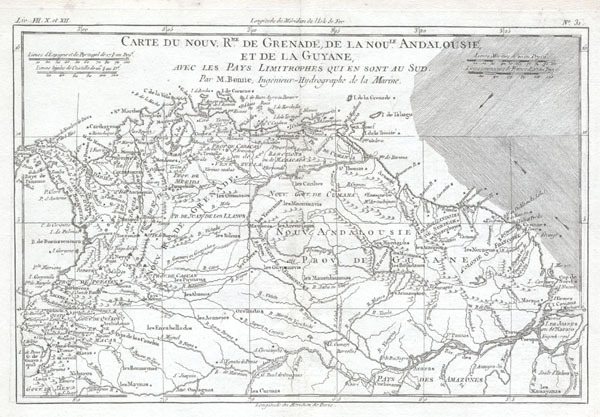 De Grenade, de la noule Andalousie, et de la Guyane, avec les Pays Limitrophes qui en sont au Sud. This remarkable map of the Northern South America (Columbia, Venezuela, Guyana, N. Brazil) by Rigobert Bonne was made in 1780. Bonne was the successor to Bellin as head Engineer of the French Hydrographe del la Marine Department. Much of the Amazon is shown and many South American Indian tribes are noted. Towns, churches, cities and mountains are depicted as miniature representations of themselves. This map is highly detailed and beautifully crafted.